is a performance artist and dancer originally from Auckland, New Zealand. 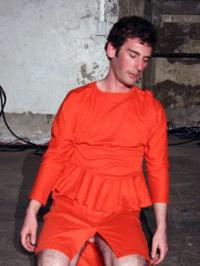 His practice is largely based in improvisation, with influences from Body Weather and Butoh. His recent work has been a series of attempts to be honest on stage though he isn’t yet sure what that even means. He has worked with several artists as a dancer, including: Brent Harris, Alyx Duncan, Josh Rutter, Alicia Frankovic and Brydee Rood. In 2007 he formed the company Release Candidate with Josh Rutter which is ongoing though on a break, due to its members living on different continents.